In order to avoid the first-pass effect ofthe liver, testosterone can be applied rectally in suppositories (Hamburger 1958). Administration of a suppository containing 40 mg testosterone results in an immediate and steep rise of serum testosterone lasting for about four hours. 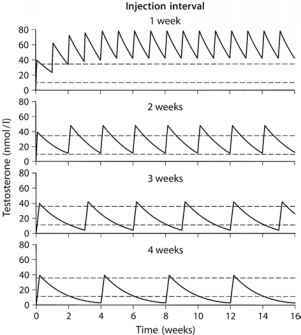 Effective serum levels can be achieved by repeated applications (Nieschlag et al. 1976). This therapy, however, never gained much popularity probably because the patients find it unacceptable to use suppositories three times daily on a long-term routine basis.